July 24, 2017 – Boston, MA – Copenhagen Beer & Music Festival, one of the world’s most celebrated craft beer events, returns to Boston’s City Hall Plaza thisSeptember 22 and 23, 2017. Copenhagen Beer & Music Festival will once again bring over 50 international and domestic breweries to Boston, placing emphasis on rare and coveted brews. 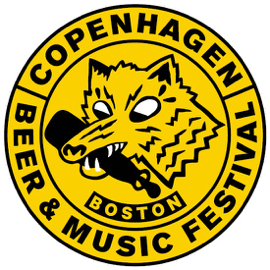 Copenhagen Beer & Music Festival, co-produced by Mikkeller and Boston Calling Events, received glowing reviews and was deemed by Paste magazine as one of the “12 Beer Festivals You Have to Attend in 2017.” Tickets for the Copenhagen Beer & Music Festival are on sale now at www.copenhagenbeerfest.com. Copenhagen Beer Festival will once again take place at City Hall Plaza, located at 1 City Hall Square, Boston, MA 02201. During three sessions, beer-lovers will have the opportunity to taste beers from some of the world’s most sought after breweries, including Sweden’s Stigbergets, Belgium-based Bokkereyder, Cloudwater Brew Co. from Manchester, England, and, of course,Mikkeller, the celebrated Copenhagen gypsy brewer. These international brewers will be joined by some of the best beer makers in the United States, such as Brooklyn-basedOther Half, 3 Floyds Brewing Co. from Munster, Indiana and Funky Buddha from Oakland Park, Florida. Copenhagen Beer & Music Festival will also welcome the most celebrated breweries in Massachusetts, bringing Framingham’s Exhibit ‘A’, Everett’sNight Shift, Woburn’s Lord Hobo, and Boston-based Trillium to City Hall Plaza. Music will once again compliment the festival’s all-star beer lineup. Performing this year are vintage surf rockers and Denmark natives, The Tremolo Beer Gut, Boston’s favorite beer-swigging country-folk-punk-rock band, Tigerman WOAH, American rock band These Wild Plains, and multi-instrumentalist and psychedelic country singerHayley Thompson-King. Copenhagen Beer & Music Festival’s lineup of food vendors will also be announced in the coming weeks. Copenhagen Beer & Music Festival’s Session Tasting Times are as follows. The first hour of all session times are reserved for VIP Guld admission. Copenhagen Beer & Music Festival’s Music Lineup is as follows. Performance times are forthcoming. *Artists are subject to change. Tickets: Tickets are on sale now at www.copenhagenbeerfest.com. NEW THIS YEAR: ALL TICKETS INCLUDE UNLIMITED SAMPLING. All ticket buyers must be 21+ to purchase and attend. Social Media: Follow Copenhagen Beer Festival on social media: Instagram: @CBCBOSTON; Twitter: @COPENHAGENBEER; Facebook: Copenhagen Beer Festival Boston. Boston Calling Events is a Boston-based entertainment production company that owns and produces dozens of events each year. Formed in 2012 by Brian Appel and Mike Snow, Boston Calling Events continues to build its event platform around Boston Calling Music Festival and Copenhagen Beer & Music Festival.